If you visit Trafalgar Square today you'll encounter an enormous golden "sun" more powerful than 60,000 light bulbs, filling the square with light and cheering everyone up on what is an otherwise fairly grey January day. 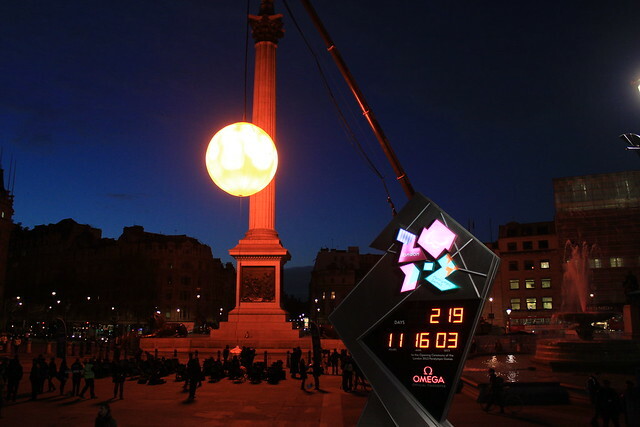 The "sun" will "rise" and "set" as it traverses the square during its single day of life; it's an installation commissioned by Tropicana Orange Juice and created by public art collective Greyworld. The work of Greyworld focuses on 'Playing in the City'; I like their work a lot because of the sense of fun and carefree interaction it invites from members of the public, and the way in which their work actively encourages the habitation of public space for fun and for play instead of just for purpose. Previous works of theirs include road side railings tuned to play 'The Girl from Ipanema' should a child, or adult, happen to run a stick along them, and park benches on wheels with a life of their own which rolled around a square in Cambridge; chasing the sun, automatically hiding beneath trees when it rains and coming towards you if beckoned them with a whistle. Photo from London Cyclist - 216 days till the Paralympic Opening Ceremony! Successful city spaces should not just be a place of purpose; London especially suffers from the affliction of the majority of its public space merely being a corridor through which to get from A to B. But city spaces should not just be space for adults in which to play, either. The sign of a safe and successful city is not just a space in which adults are happy to linger, and play, but one in which children are too. We go to great lengths to create parks and playgrounds to provide space for children to play in, and yet do these more formalised, designated places for play actually constrain children? Do they do enough to stimulate and challenge children as well as make them feel a part of the community in which they are playing? Jane Jacobs, in The Death and Life of Great American Cities, argued that parks and play grounds were boring for children and offered limited stimulation to a child with a healthy sense of their own surroundings. Local streets, she believed, were a much more successful space for children's play and indeed for growing up - they could be observed by adults to check their behaviour, and in turn the children could observe the adults to see life going on around themselves and feel engaged as a part of it. But in order for streets to feel like somewhere that parents will allow their children to roam freely, must there be constraints on other kinds of movement? Should streets be closed, such as on play days or for street parties (see my previous post on the excellent work by Playing Out), or should traffic on each street where children live be suitably tamed to allow space for people and successful sharing of the space between the buildings? In his book Life Between Buildings, Jan Gehl argues that "something happens because something happens because something happens". That is to say, a group of children building ramps and obstacles for their bikes in the street, and playing outside their homes, might lead to older neighbours sitting outside on a bench to watch. The old folk are more inclined to stay because there is something to see and keep them entertained. Neighbours might look out their window to watch their own kids, and see another parent to catch up and have a chat with and so step outside. Drivers passing through the neighbourhood, seeing that they are observed and guests in a space which is not just for cars, drive appropriately. The opposite is also true; if there's no one outside there's nothing to see. If there's nothing to see, and no one else to play with then kids would rather stay indoors and watch TV or play on the internet because the outside has become boring, unstimulating, a place without people. A place without people is unobserved and anything can happen within it; cars can speed by unimpeded, thus in turn creating an even less pleasant environment for play. And so kids playing on their bikes in the street create a special spiral of positive consequences. Children not playing outside creates the opposite. Suddenly, simple games and infant past times become very important to the liveability of our city indeed. As a child my bicycle was my passport to freedom. Learning to ride a bike was a revelation. My "catchment zone" expanded in size by three - whereas previously I could walk to the end of my street in 15 minutes (about the length of time I was prepared to toddle in any direction), with my bike I could get to the end of my street, the park beyond and my friend's house beyond that in the same amount of time. Bucolic summers were spent exploring the entire neighbourhood on two wheels, drowning in jugs of orange squash served by various friend's mothers and taking my bike to the edge of the town where the countryside began; the borderlines where dares were set and competitions were held. As I grew older the horizons expanded still further; out beyond the urban edgelands and borderlines and in to the country proper where hedgerows weighed heavy with sticky Blackberries and the kestrels flew and the grass grew long in the woods. I worry that across the UK there must be thousands of children growing up in similar suburban surroundings who are missing out on a childhood outdoors and on two wheels. 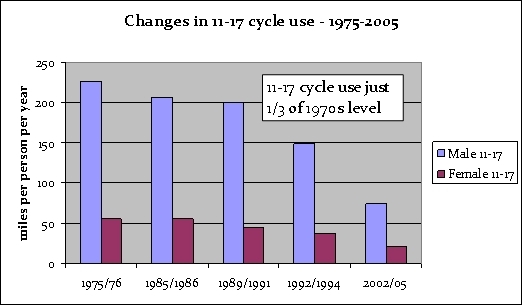 The CTC frets that since the 1970s there's been a continued and downward trend in young people using a bicycle. The situation is especially bad for young females. And if things are bad out in the green and gardened suburbs, they're even worse here in the heart of the big city. You won't see kids riding the Elephant and Castle roundabout unaccompanied, and dare I say it it seems increasingly apparent to me that what few children you do see living and growing up in London's Zone 1 and inner Zone 2 are the sort being chaperoned around Hyde Park's Serpentine by their nannies, with 4x4'd butlers standing by to whisk them back to Knightsbridge. For a multitude of reasons there are less and less children in our streets, and this makes our city a poorer place for it. On the 7th February, Tim Gill will be arguing that this needs to change in the next Street Talk from the Movement for Livable London. Tim is the author of the 2007 book No Fear; Growing up in a risk averse environment and blogs at the always fascinating Rethinking Childhood. He'll be arguing that children are like returning salmon coming back to recently polluted waters; an indicator species for the liveability and success of our streets and indeed wider cities. Join us from 6PM (talk commences at 7PM) in the upstairs bar at the Yorkshire Grey pub on Feb 7th, and as always you can follow and contribute via the hashtag #streettalks, or listen again to previous talks online. The Greyworld "sun" will shine throughout today, Monday 23rd January 2012 in Trafalgar Square and will 'set' a few hours after darkness, allowing plenty of time throughout the day to interact with this unique piece, and have some fun in one of our most famous city spaces. 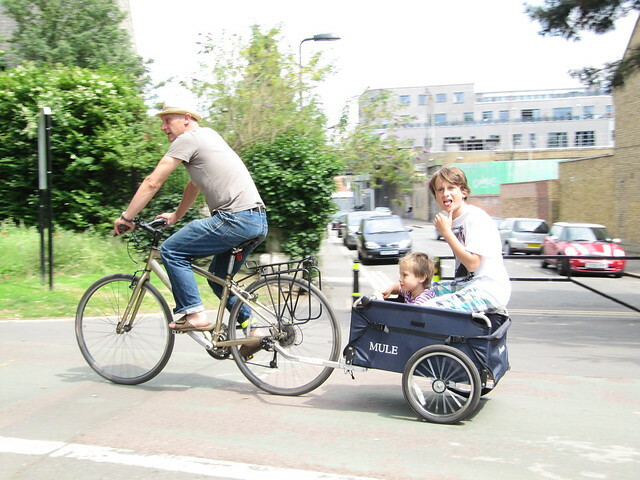 Would you let you children play freely and cycle unsupervised on the streets where you live? If not, what is wrong with the roads around your home and what could be done to improve them? I have the good fortune to live not on a street, but a lane - in a rural setting, with the National Trust-owned Hindhead Common just behind my back fence. I have no qualms about my kids playing anywhere around here, at least not in terms of traffic. However, within a mile from me, still in the leafy Surrey town of Haslemere, I would be less sure. For example there is a residential road, wide and straight but with a fair bit of "dead ground" due to its contours, which forms part of an unofficial bypass, a rat-run for motorists who wish to avoid driving through the town centre where those pesky pedestrians use the pelican crossing (only one) with irritating frequency. This detour must be 50% longer than going direct, ie an etra half-mile, so of course they have to make up the "lost" time - I have rarely seen through traffic doing less than 40mph on this 30 limit street. The only thing which slows them down is that during the working day the street is also a vast free car park for the nearby railway station. That itself is the subject of proposals for on-street parking charges which are attracting the sort of venom which we have just seen in Westminster. Of course, being Surrey, the kids get ferried around in their parent's Volvos from violin lesson to cricket practice so that they are rarely left the time to simpoly play in the street! @Paul M Haslemere sounds very much like where I grew up. SO much potential for a nicer urban environment for people of all ages, if only a bit more thought went in to the application of it all. Playfulness takes many forms. But I agree with you that one of its most compelling and significant forms is the kind of playfulness shown by children when they are freely exploring and enjoying their neighbourhood. I will indeed be exploring this territory in my streettalk next month - thanks for the plug! Mark - thank you for this excellent article, the timing of which could not have been better. My local councillors are currently canvassing opinion on the '20's plenty' scheme for our area and also asking for alternative ideas. I am in the process of draughting a fairly long reply about the 'livability' of our streets. I'm not in London, but your article and the comments above are perfectly applicable to where I live. I will be sending a link to this web-page if that's OK.